Brown and crumble ground beef in a large skillet over medium-high heat. Drain grease. Add taco seasoning and water called for on packet. Stir until mixture comes to a boil. Reduce heat to low and simmer 10 minutes. Remove from heat and let the meat cool slightly. 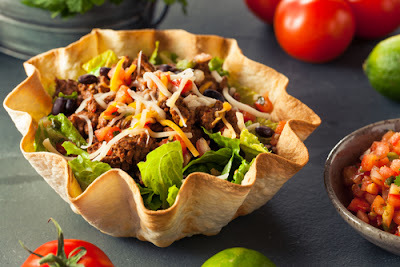 In a large salad bowl add chopped lettuce, black beans, tomato, and cheese. Add slightly cooled ground beef and gently toss to combine everything. Serve now, or chill in refrigerator until ready to eat. When ready to serve, add Doritos chips and dressing to the salad. Toss to coat. Serve.